Open Call for Entries | Join Year in Review by January 10th! Let this be the year the world sees your art. 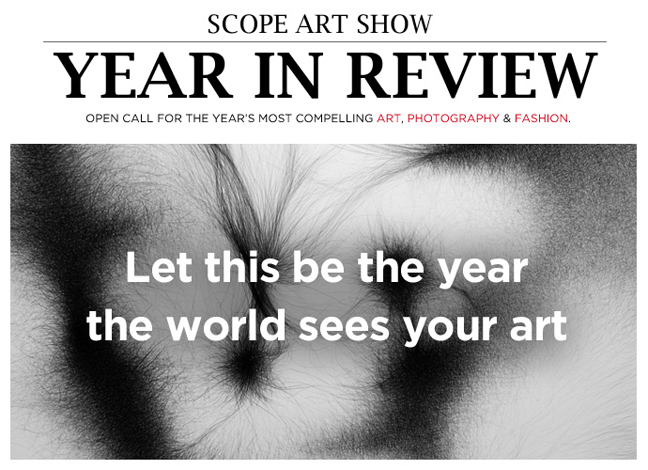 The 3rd annual Year In Review is an international call for art awarding a $20,000 Grand Prize package and more, including an exhibitor booth at SCOPE during New York City Art Week. One creative visionary will be selected to receive an exclusive feature booth in NYC this March at SCOPE Art Show, the premier showcase for international emerging contemporary art and one of the most influential presences in the expanding global art market. Our goal is simple – to find amazing talents and expose them to the world in the most potent way possible. Submissions accepted through January 10, 2014 11:59pm EST. Get your work reviewed by leaders in the industry from SCOPE Art Show, Printed Matter, Los Angeles County Museum of Art (LACMA), Creem Magazine, and United Photo Industries.